Shop online for 104 n scale model train sets at discounts up to 41%. 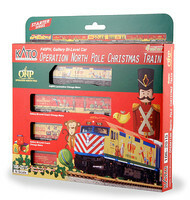 Kato USA Inc is ranked #1 out of 7 n scale model train sets manufacturers, followed by Bachmann, and Trix. This is the N Scale E-Z Track Durango & Silverton Complete and Ready-to-Run Electric Train Set from Bachmann. Suitable for Ages 14 & Up. American railroads helped build great fortunes and the wealth of the Nation. Doing its part, our Empire Builder train set comes complete with Bachmann's exclusive E-Z Track snap-fit track and roadbed system. Modeling the shorter distance (and northeast corridor) Intercity passenger cars - the Amfleet II and Viewliner sleeper, respectively - these cars are decorated in Amtrak's most current paint scheme: the Phase VI (also known as "IVb"), which marries modern aesthetic simplicity with the traditional Amtrak red, white, and blue stripes. Pairing modern sensibility with Kato's proven track record of smooth rolling trucks and award winning performance locomotives, these sets are ideal for modern passenger modelers. Thunder Valley is a Complete & Ready to Run N Scale Electric Train Set by Bachmann Suitable for Ages 8 & Older. 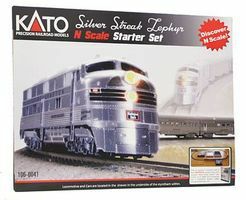 This is the N Scale Silver Streak Zephyr Starter Set - Chicago, Burlington & Quincy (silver, black) by Kato USA inc. This is the N Scale E-Z Track System Spirit of Christmas Electric Train Set from Bachmann. Suitable for Ages 14 & Up. As the West developed from desolate wilderness to bustling cities, it was trains such as the Trailblazer that spearheaded America's explosive growth from coast to coast. Our 60-piece Trailblazer set with its 4-6-0 locomotive lets you experience all the excitement of the Iron Horse's journeys through the crossroads of railroading history! This is the N Scale E-Z Track System Super Chief Complete and Ready-to-Run Electric Train Set from Bachmann. Suitable for Ages 14 & Up. The Yard Boss is a Complete & Ready-to-Run Electric Train Set from Bachmann Suitable for Ages 8 & Older. 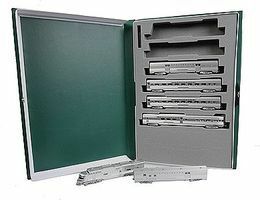 This is the N Scale F40PH Commuter Train Starter Set - Metra by Kato USA inc. This is the N Scale Freightmaster Complete and Ready-to-Run Electric Train Set from Bachmann. Suitable for Ages 14 & Up. The ES44AC "Gevo" and Mixed Freight starter set includes Kato USA's latest powerful six-axle freight locomotive in one of five paint schemes and an assortment of six specially decorated mixed freight cars (two tanks cars, two hoppers, and two gondolas), along with a complete 3'x4' Oval of Kato UNITRACK with re-railing track, a Kato Power pack, and a starter guide. Everything you need to begin building an N gauge train layout at home! This is the N Scale McKinley Explorer Complete and Ready-to-Run Electric Train Set from Bachmann. Suitable for Ages 14 & Up. This is the N Scale The Stallion Complete and Ready-to-Run Electric Train Set from Bachmann. Suitable for Ages 14 & Up. 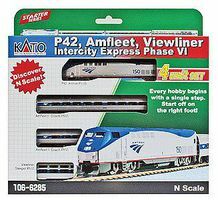 This Amtrak Starter set includes a Santa Fe F7A locomotive and three passenger cars from the Santa Fe "Super Chief" train set (4-4-2 Sleeper Regal Court, Diner #601, Observation Vista Valley), along with a complete 3'x4' Oval of Kato UNITRACK with re-railing track, a Kato Power pack, and a starter guide. Everything you need to begin building an N gauge train layout at home!